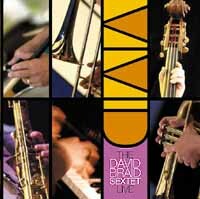 David Braid - "Vivid: The David Braid Sextet Live"
It was released in 2004 originally, but emusic has it as a current release, and so does alternate sites like lastfm, lala, etc, so David must've recently struck a deal to get his albums out there. Vivid is a strong straight-ahead jazz album. Very good sound for a live performance. It has much of the light-hearted strength of, say, Don Pullen's Bluenote work (minus the South American influence). There's a companion live album from a subsequent year that also sounds pretty good. I mention this album just because it's the kind of thing that can get lost amongst emusic's huge selection. Also, I'm not listening to much straight-ahead jazz these days, so for something to really strike me like this album did, I figure maybe others will be similarly affected. VERY IMPORTANT: eMusic has TWO different entries for this album. One has it set at album pricing, which means you pay twelve downloads for eight songs. The other, however, has it set for a cost of 8 downloads for 8 songs. It's the latter page that I've provided the link for. A beautiful album. It's both introspective and celebratory. I know some people aren't fond of solo albums (on any instrument), but this is a good one to take a chance on. I find myself listening to it repeatedly.